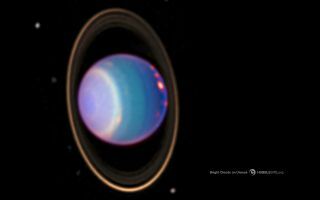 The green and blue regions show where the atmosphere is clear, allowing sunlight to penetrate deep into Uranus. In the yellow and gray regions, a haze or cloud layer is reflecting sunlight away. This space wallpaper shows green and blue regions where the atmosphere is clear, allowing sunlight to penetrate deep into Uranus. In the yellow and gray regions, a haze or cloud layer is reflecting sunlight away. Orange and red colors indicate very high clouds, like cirrus clouds on Earth.